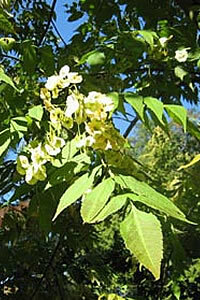 Spreading deciduous tree with pinnate leaves that bears erect panicles of small greenish-white flowers in summer. Flowers are followed by flat winged red-brown fruit. Height and spread 30 feet. For maximum freshness, please keep seed refrigerated in its original packaging until it is time to plant. Sow seed in a seedbed in autumn. Grow in moist, fertile, well-drained loamy soil in sun or part shade.